Here we are. It’s been one year since Bike Bianchi landed upon the shores of Beliribon, Iowa and launched SCFL Fire Pro Wrestling. Now, he’s somewhere in Mexico for alleged homicidio involuntario, there are two other Bike Bianchis including a mayor, multiple people are dead, dozens have been taken by the Shadow Realm, and friendships have been made. Can you believe we’ve been here for a year? No. Can you believe the world title has been lost for months? Yes. So here’s what’s going to happen. Let Liu is putting on a tournament with all the former SCFL champions and Wim NBijman, which makes sense considering Wim is so good. This means a new world champion will be crowned tonight, on the one-year anniversary of SCFL! But, Ichabod Adams was hit by a car last week. Can he perform? Miles Manhoef had knee surgery again. He said he had to relinquish the title. The champion fighting for his recently-relinquished title on bad knees is proper SCFL. Then there’s Bike Bianchi. He’s in Mexico. And Freddy Fischer – what Freddy are we getting? And then there’s OFFERS Thompson taking on a mystery fighter in a chance to make DOT TV history. 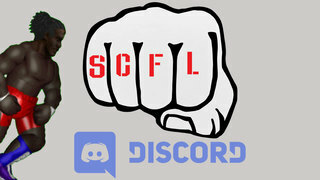 SCFL Fire Pro Wrestling World goes down Sunday night at 10pm est! Happy anniversary!